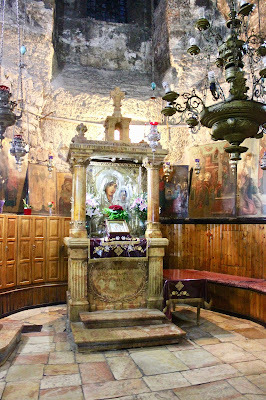 The Roman Anglican: The Tomb of Mary in Jerusalem. 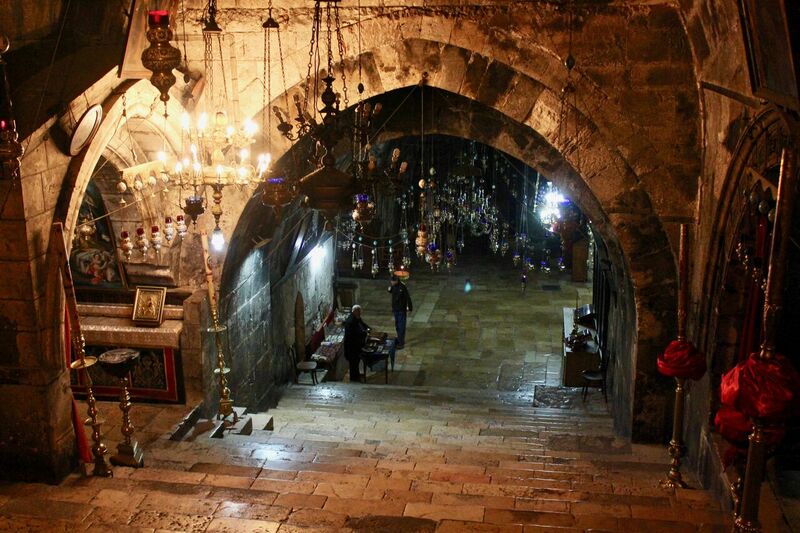 The Tomb of Mary in Jerusalem. Jerusalem, the glorious city of Zion, located in the beautiful landscape that is the Holy Land of Israel or as the Romans referred to it after the sacking of the Temple, Syria Palestina; sacred to the Jew, Christian and Muslim alike is the city of God the Father, where his holy name is daily praised at what remains of the Holy of Holies, it is the city of God the Spirit, it is here that the Apostles received it while celebrating Shavuot, a celebration of the giving of the Torah, and the Harvest, it is the site of the Pentecost, and of course it is the city of God the Son, it is here that the little Jesus of Bethlehem and Nazareth became the Christ of the Cross and Resurrection. 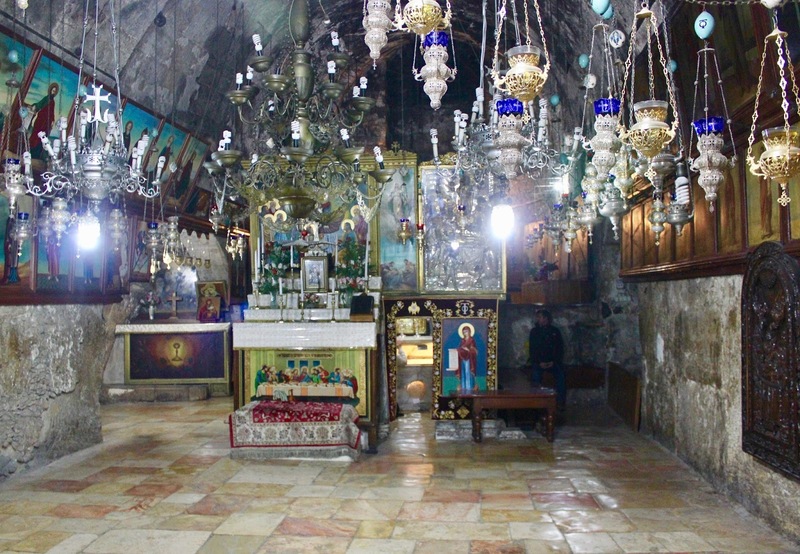 It is also where the Church of the Holy Sepulchre and other sites are found, where thousands of Christian clergy and pilgrims gather to give the incarnate God his praises. It is also interesting to know that where Jesus was, there was Mary, his virgin mother, highest among all saints. It is here that the little maiden that became a holy tabernacle of God, according to traditional legends, met her creator. 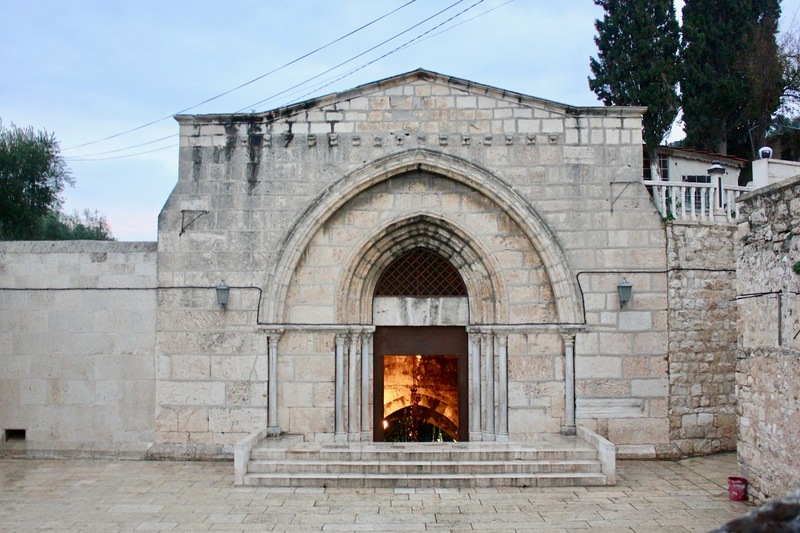 One of the many Marian shrines of Jerusalem is indeed the Church of the Tomb of Mary. This, one of the most fascinating churches in Israel, is located at the bottom of the lovely Garden of Gethsemane on the Mount of Olives, where Jesus retreated the night before the Passion, where Jews and Christians have been burying their dead for more than three thousand years and where they believe the Messiah will eventually come again, bursting all the tombs open and bringing all the dead back to life. 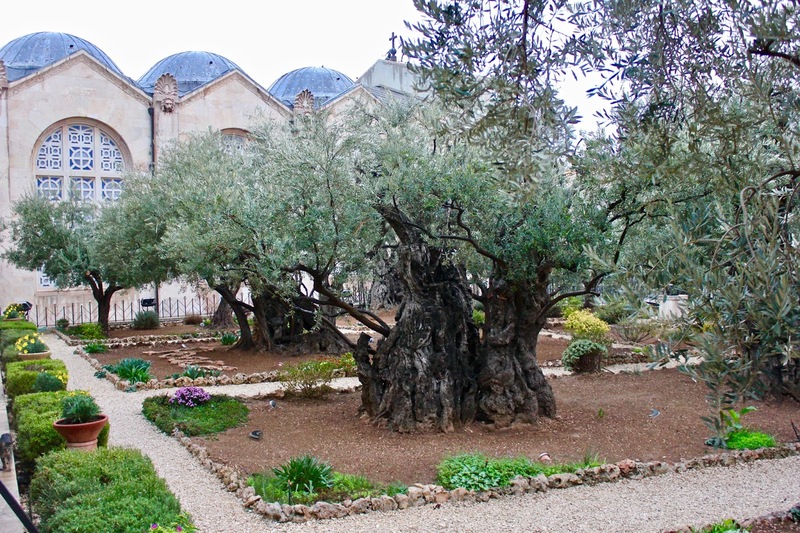 The New Testament may be silent on the end of Mary’s life, but several early apocryphal sources, such as Transitus Mariae and others, as well as accounts by various early saints, describe her death and burial in Jerusalem. The ancient tradition regarding the death of Mary, the so-called Dormition, teaches us that the Virgin fell asleep, the beauty of early Christian and Eastern theology is that it doesn't try to explain the inexplicable. After she fell asleep, Christ received her soul directly and her body was resurrected on the third day, when she was taken up into heaven in anticipation of the general resurrection of the dead (the Assumption-theology also derives from this). According to tradition, her tomb was then found empty, leaving only a shroud and a cinture (the girdle) which eventually became a popular theme in the iconography of the Assumption. The Golden Legend, the Renaissance collection of the lives of the saints, instead states that all the Apostles, but Thomas, arrived late but were there (you can read more in my post about the Dormition, the link is above). In 1972, Bellarmino Bagatti, a Franciscan friar and archeologist excavated the site and found evidence of an ancient cemetery of the 1st century on the site, as it was the case with Jesus' tomb. A small upper church in the Constantinian style was originally built on top of the present one in the 5th century but it was sadly lost during the Persian invasion of 614, when the Holy Sepulchre was also first destroyed, thankfully the crypt was left untouched. The church was rebuilt in 1130 by the Crusaders in the early Gothic style within a large Benedictine monastery, the Abbey of St. Mary of the Valley of Jehoshaphat, a name still used sometimes to describe the church. Again, the church was destroyed by Saladin in 1187, but the crypt was again respected, only the entrance and staircase survived. In the 14th century the Franciscans rebuilt the church and later in the 18th century the Greeks took over the building during a Palm Sunday Mass, together with other holy sites, the Ottomans supported the Status Quo and since then it remained in their hands. To the south, the building itself is preceded by an imposing walled courtyard with the 12th century Crusader Gothic façade on its east end, the cruciform church is effectively a crypt as its gloomy interior, darkened and perfumed by centuries of candle and incense smoke, was excavated in the rock as a church during the 5th century, making it the oldest near-complete religious building in Jerusalem. Leading to it is a 12th century set of stairs, where the chapel of Mary's parents, Sts. Joachim and Anne, is to be found. 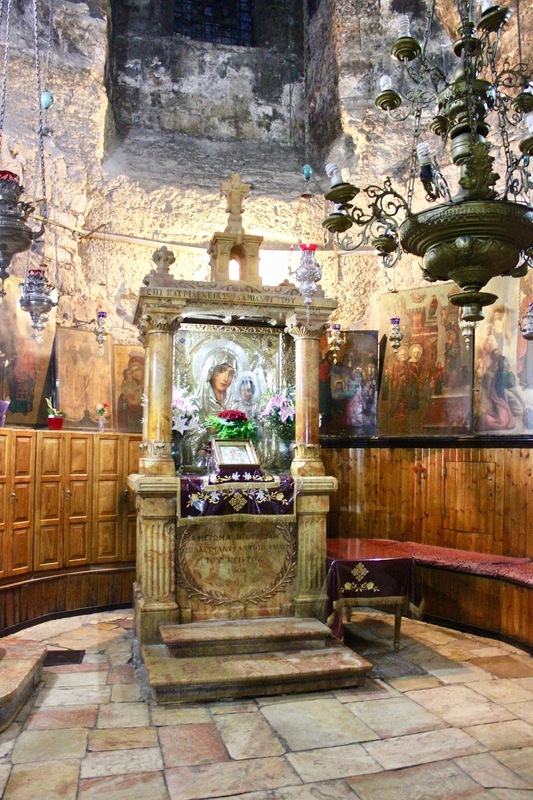 On the eastern end of the church, what we could refer to as the apse, we find the chapel of the Virgin's Tomb, which is effectively a small Aedicule, not unlike the one at the Holy Sepulchre. This is where, amongst an exotic sea of flowers, icons, lamps and incense burners the supposed tomb of Our Lady is to be found, a bare tombstone, set in a Medieval structure ideated in order to make the flowing of pilgrims easy, just as in European shrines. Being able to pray by the place of the human that was the closest to God, our Mother in heaven, is indeed a powerful experience which should be part of any pilgrimage to the Holy Land. Just as in the Holy Sepulchre, this church was initially patronised by Helena, the mother of Emperor Constantine, and therefore the tomb resembles that of Jesus, since the surrounding stone was cut to isolate the stone is a similar way. Several denominations shared and share this site, it was initially Franciscan between 1363 and 1757, as most Crusader churches, they were expelled in the 18th century and the church fell into the hands of the Eastern Orthodox. Now the Greek Orthodox, among the greatest and most powerful landowners in Israel, own the church together with the Armenian Church. While the tomb of Mary is in the east end of the building, the Greek and Armenians, both owning the apse, have two altars on each side of the church. The Syriacs, Copts and the Ethiopians, as it often is the case in the Holy Land, have minor rights within the building. Interestingly, the church is also a Muslim shrine, few of us know that Our Lady, the Mother of Jesus, a prophet, appears several times in the Quran, a beautiful legend states that the place is holy as they believe Muhammad saw a light over the tomb of his sister Mary during his night journey to Jerusalem. To the south of the tomb there is a little niche, a Mihrab, that indicates the direction of Mecca. This was installed when Muslims had joint rights to the church, since the Islamic invasion and Ottoman Empire times, this lasted until the late 1960s, when Israel and what was then TransJordan were occupied by Jordan and freedom of worship was extremely limited for Jews and Christians alike until the liberation in 1967. The church is never really busy and not many know of it, but there I found a holy and mystic atmosphere, a transcendental sense of vicinity to the Virgin Mary that brought me close to the gentler side of our Creator and Maker in a very special place: Jerusalem. The incense, the gloomy crypt and the candlelight bring us all back to a time of old in which Mary was much more than just a saint, but the real Mother in heaven, the mother of the early Church and the Mother of Jesus who can only bring us closer to the Trinity and a into more intimate relationship with Christ through the echoes of her lauds and prayers. My soul doth magnify the Lord, and my spirit hath rejoiced in God my Saviour.